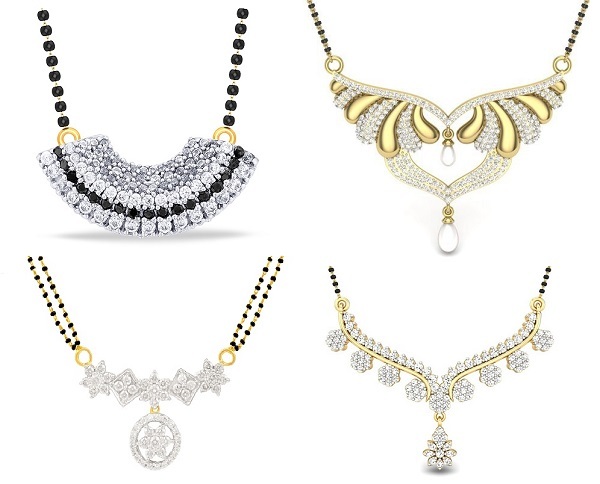 Mangalsutra is one jewelry piece that every Hindu women would love to wear. It is a sign of being married and blessed with husband. 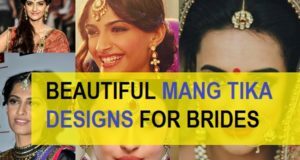 These days, jewelery trends are changing hence women would love to experiment even with the mangalsutra designs as well. Mangalsutra can be made in gold, diamond, platinum or mixed but gold is one such precious metal that is widely used in India. 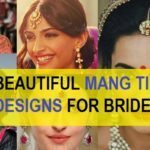 Indian Mangalsutra design varies from region to region like there are different designs in Maharashtra, South India etc. Preferences are different for every women. Some like to keep it short and simple while some would want their mangalsutra to be heavy and with wide chains. It’s a very dainty looking mangalsutra with pure gold work. The thin chain makes it very easy to wear in daily life. The pendent is round in shape with tiny beads at the end. 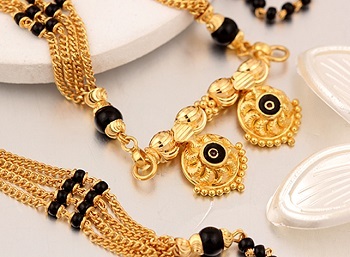 There is only single chain that has solid gold part and the traditional black beads. 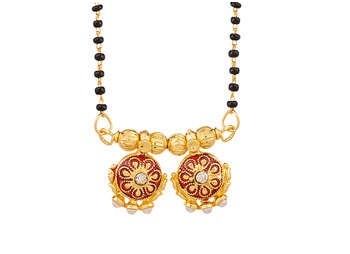 The black beads are an essential part of any mangalsutra whether you make one in gold or diamond. This design has a very trendy and fashionable pendent which gives it a necklace type of appearance. This can be worn for everyday or for the ceremonies. This is craved in gold with thin chain and slightly bigger beads. 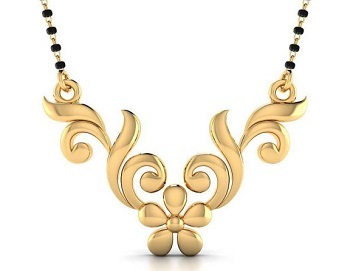 The solid gold bead at the end adds more charm to this beautiful design. 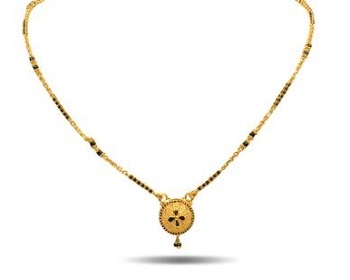 This is a very modern looking design for gold mangalsutra as the pendent looks royal and yet simple. There is carved detailing on the round pendant which ends in another tiny trinket. The chain is the most interesting part as it has double chain halfway and then there are triple gold chain with black beads after the other half end of this mangalsutra. This makes this modern yet Indian in design. This is a very basic and Indian design. The two round half beads are classy and looks really nice. 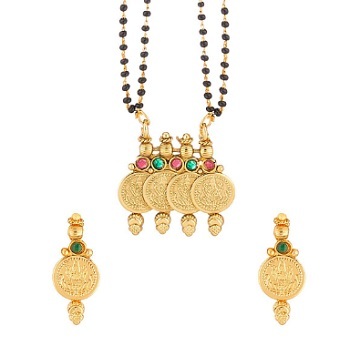 The old world charm that the half round gold beads have is just beautiful to look it. This is simple but the heavy thick chain halfway makes it look alluring. 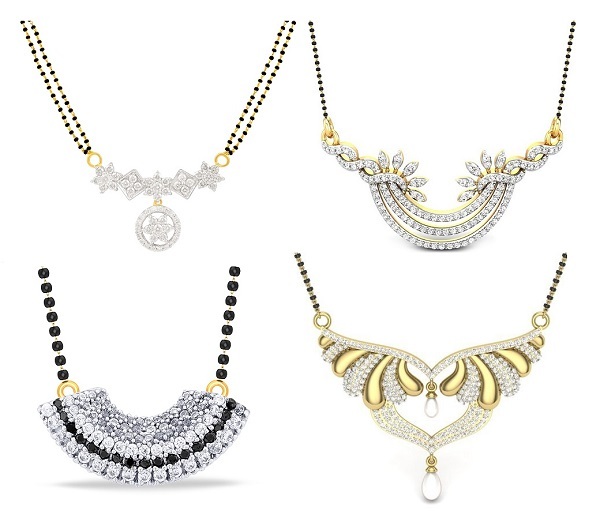 Such mangalsutra can be worn for everyday as well as when you gt ready for an occasion, festivals or weddings. This too is very simple and contemporary design where there is a solid gold floral leaf pattern with a single thin black beaded chin. The chin is thin hence, such design can be worn for work. The pendent design do not have any detailing inside which makes it good for everyday use. This is also light weight hence in summers too one can wear them everyday. This mangalsutra design is ideal for modern Indian women who like to stay touch with their roots hence the design is not heavy but has a dash of Indianess. 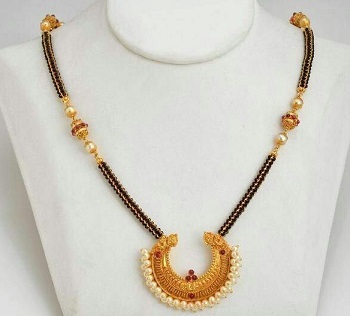 The pendent is made with the evergreen style of two half hollow gold beads adorned with pearl beads. The chain is single and has black beads in them. This design is very modern and is very delicate and feminine looking as well. 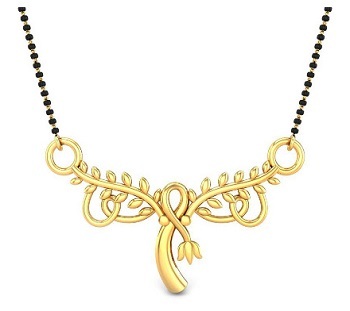 The coiled leaf pattern in gold look quite good with a single chain. 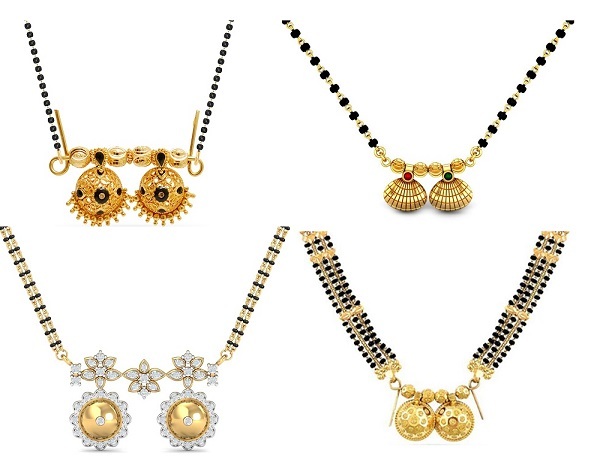 Such pieces are for Indian girls who does not like heavy or gaudy jewelry pieces. Simplicity is the term for this piece. Even when you wear some other piece of jewelry in neck. This can still be there as the subtle design will not look and with any other heavy piece of jewelry. This mangalsutra has dual chain but a very heavy looking pendent. The pendent work is inspired from the south Indian temple jewelry design that is extremely popular. The four coins aligned with each other bears the lord Ganesha’s images and the earrings are also made similar and very special with goddess Lakshmi’s imprints. 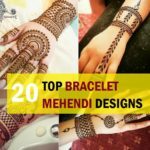 Such designs are very famous in South India though In North India too women are liking such designs. 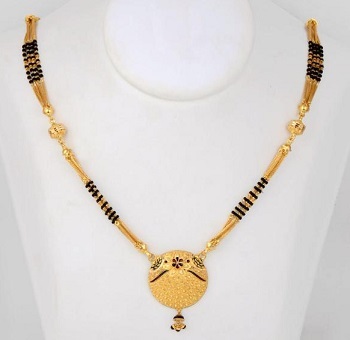 The mangalsutra has the basic twin beads but the design and intricacy that they have is different and unique. Even the chain is not the regular black beaded one, but the regular chain is used and beads are used after a gap. This makes this good for women who like moderately heavy mangalsutra but nothing very heavy or traditional looking. There are 4 chains which makes it durable as well. 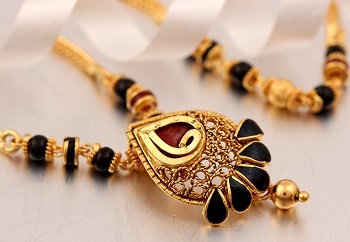 Since when the mangalsutra has one chain then chances are high that after some time, the chain will get damaged from in between or the thin gold thread supporting the beads can go off place. This is a very typical Maharashtrian and kundan inspired jewelry design. This has the best of both worlds as you get the look of the mangalsutra and of a necklace as well. The half moon resembling pendent with pearl beads are not only new and modern looking yet gives classiness. The black beads are woven strongly to make a thick chain. In between the chain big gold beads add more beauty to this piece. 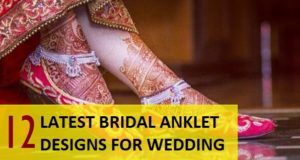 If you like to wear your mangalsutra occasionally or would like to wear heavy mangalsutra when you get ready or festivals and wedding then such designs are suitable. 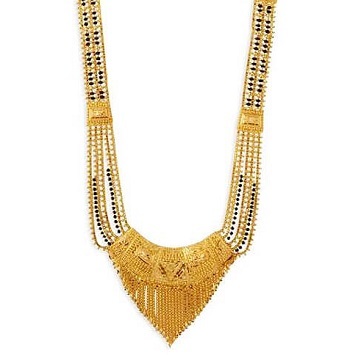 This design is made with beautify and very delicately placed chains of gold. The pendent is made of solid gold with tiny gold chain handing in a V shape. The chain is made with 5 thin chains with alternating black beaded chains. This looks very heavy and yet wont feel heavy on the neck. The necklace resembling design can make you skip your necklace instead wear this alone.